The perfect conference and business venue. Every business meeting or conference is better held in a comfortable, relaxing, environment. Even better still, when the venue is in the heart of the Lake District and resourced with a complete range of facilities together with an efficient team to ensure that every need is met. That is exactly what the Whitewater Hotel delivers. 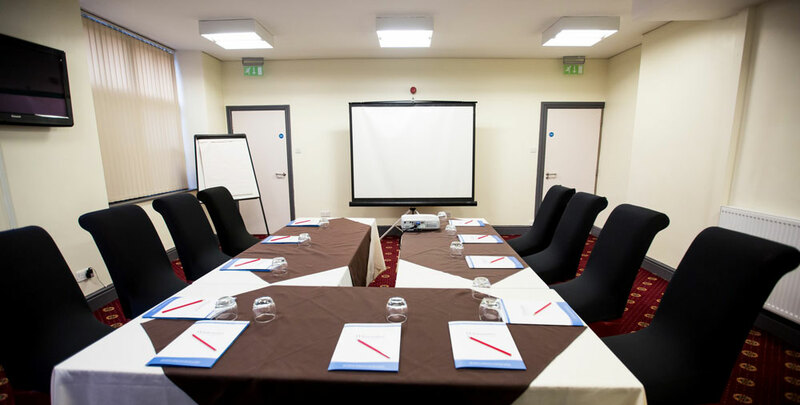 The well equipped conference room can accommodate up to 80 delegates. Smaller suites are available and our services will match any busy schedule. If plans include team building events such as Raft Building and Racing, Treasure Hunts, Team Challenges. Whitewater’s team will make them, or any other, happen. If a shoot needs to be organised, we will arrange it and be there with the bacon sandwiches to start the day right! Whatever the requirements, from an intimate business luncheon to a full conference dinner, the catering team provides memorable dining. To complete the experience, delegates can become temporary members of Cascades, the onsite Leisure, Health and Fitness Club. They can relax in the swimming pool, sauna, steam room or whirlpool; workout in the modern, air conditioned gym, book a game of squash or tennis. A table tennis tournament can even be arranged! The beauty Spa can also be booked. Fully inclusive packages can be arranged to suit the precise conference requirements. Business to business, leisure and pleasure; The Whitewater Hotel and Leisure Club will ensure clients profit well from their conference. Request a quote from our conference team.